A psychotic killer, a FBI trainee and a cannibal are the three fundamental characters that make up this thrilling crime drama. 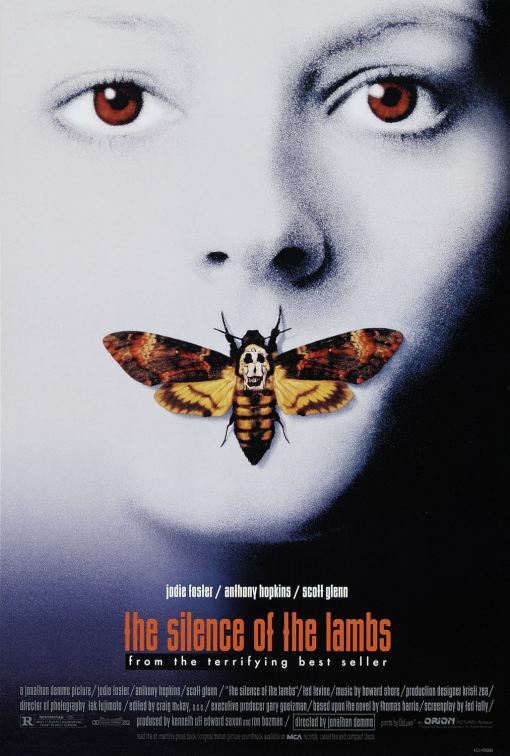 It is one of many in the series involving Dr. Lecter, but this is one that hits home for me and provably watched it a little too young, but went back to it years later and truly saw how great a film it really was. The film is through the eyes of the FBI trainee, Clarice Starling played by Jodie Foster. Amazingly Jodie has actually kept very well over the years, unlike other actresses, but that’s beside the point. It is Dr. Hannibal Lecter played by Anthony Hopkins, that steals the show in this film as the sinisterly genius killer that always leaves you uneasy when he’s on screen. Even when locked in chains and cuffs with police supervision, or behind a giant clear walled cell, he still causes a sense of fear and intimidation. His role is actually to help Clarice in catching Buffalo Bill. They grow to know each other as Lecter mentally tests and toys with Clarice as she seeks help. Like I hear from people who enjoy watching Dexter, it takes killer to know a killer. The weird relationship the two main actors share on screen is what makes the two characters so well matched. You have a man who is jailed and chained because he is a serial killer and cannibal, yet a well educated man. On the other hand you have Clarice who is seen a beneath the other officers due to her being a woman. They share similarities in their childhood of being unloved and abused. She knows better than to insult his intelligence and maybe this is why Dr. Lecter chooses to more helpful then he then he needs to be for his own gains. The film direction and the actors are able to create a real sense of fear to the audience. Still pretty scary when you got a guy who kills people and takes their skin to make a full body suit for himself. And multiple moments from this movie are references from a bunch of cartoons from Recess, South Park, Filmore and American Dad. A certain scene later on takes you literally into the eyes of the characters and gives that real sense of unknowingness and danger. The music combined with these factors get your heart pumping as you care about Clarice and if she’s able to solve the case and become a full blown agent. There are reasons why both Jodie Foster and Anthony Hopkins ended up winning Oscars for best actress and actor for their work in the film as well as Silence of the Lambs, winning best picture that year. Dr. Lecter’s role was so well known I believe its unfortunate that people now only see Anthony as only a cannibal in all his latter films. That is just how good this movie was to me remembered and referenced to for so many years later.